At a booksellers convention breakfast, Dave Barry remembers, "people kept coming up to tell Douglas [Adams] how excited they were about his heavily promoted new Hitchhiker book. I asked him about it, and, glancing around, he whispered, 'I, umm, haven't actually started it.' 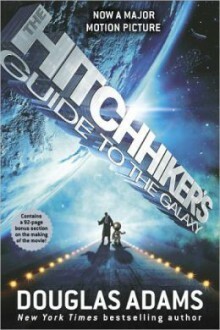 " Fortunately, Adams overcome his procrastination to write a novel adaptation of a radio serial of The Hitchhike'sr Guide. The rest, of course, is history. Adams's 1979 comic science fiction masterpiece has become a counterculture classic, selling more than 14 million copies. This 25th anniversary Deluxe Edition is packed with an astounding array of new and never-before-collected Hitchhiker material, including contributions from Douglas Coupland, Neil Gaiman, and Terry Pratchett. I would call this sci-fi on mushrooms. Funny, but very weird.On a side note: I've never been afraid of rats, but I might reconsider.